Hi! 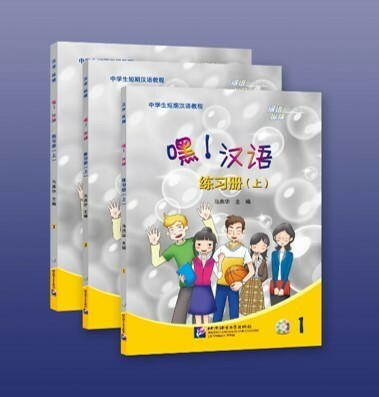 Chinese is a series of short-term beginner-level comprehensive textbooks for foreign middle school students studying Chinese in China, including two volumes of textbooks and the corresponding workbooks. Each volume has 15 lessons. This is Workbook (I). The compilation of the topics focuses on functions, and it is a series of practical textbooks for short-term courses which integrates the skills of listening, speaking, reading, and writing. There are exercises of listening, speaking, syntax, translation and writing for each lesson, and diverse specific exercises are provided for the development of the four skills. Finally, there are games and activities, which take into consideration of teenagers’ learning characteristics. In this workbook, each unit is composed of five lessons. Unit tests are designed, and there is also a final test at the end of the book. Ma Yanhua, a Professor and PhD Supervisor of Beijing Normal University, is the Director of the Phonetic Teaching and Research Office, and is a Peer-Reviewed Expert in National Social Science Fund and Hong Kong Council for Accreditation of Academic and Vocational Qualifications (HKCAAVQ).